The design of bridges in a river environment is a very complex endeavor because of the complex interactions among the structural components, the soils in which they are founded, and the moving water that imparts hydraulic loading to both. For this reason, an interdisciplinary team of structural, geotechnical, and hydraulic engineers should always be fully engaged in the bridge scoping, design, and construction processes. From a strictly hydraulics perspective, it is of utmost importance that a qualified hydraulics engineer, experienced in river mechanics, sediment transport, and bridge hydraulics be part of the interdisciplinary team. When bridges are constructed over a waterway, their foundations must be designed, detailed, and constructed in compliance with section 2.6 (Hydrology and Hydraulics) of the American Association of State Highway and Transportation Officials Load Resistance Factor Design Bridge Design Specifications or an FHWA division office-approved drainage or bridge manual. (25) In addition, the bridge impact on the numerous floodplain values that may be present must be evaluated in accordance with the U.S. Code of Federal Regulations (23 CFR Part 650 SubpartA). (26) These compliances are required for the project to be eligible for Federal assistance. Abutment location: Bridge abutments are typically set back from stream channel banks to minimize potential stability problems, scour, and impact loads. Impact loads can be expected on streams that transport ice, large cobbles, boulders, or large woody debris such as tree trunks. It is recommended that abutments be set back from the channel banks a minimum distance of twice the design flow depth in the channel or 25 ft (7.6 m), whichever is less. Flow depth should be established by water surface modeling. Adverse flow conditions: Adverse flow conditions generate complex hydraulics and increase the potential scour and stream instability at a bridge site. Adverse flow conditions result from bridges that have the following characteristics: (1) are highly skewed to the flow, (2) severely constrict the flow, (3) encroach on flows in steep channels, and (4) produce overtopping of the bridge or an approach roadway. Crossings with one or more of these adverse conditions must be evaluated with advanced hydraulic modeling techniques (two-dimensional modeling) to identify accurate flow depths and velocities at the necessary locations. Local drainage: The potential for unbalanced water pressure exists when an abutment wall can become partially submerged by a flood or when surface drainage is not controlled. All vertical-wall abutments should include provisions to accommodate surface and subsurface drainage. The following critical areas should be considered: behind the wall, at the base of the wall, and any location where a fill slope meets the wall face. For example, the design needs to include provisions for surface drainage along the fill slope adjacent to wing walls. The listed descriptions of hydraulic design considerations reflect preferred conditions for shallow foundation abutments. The greater the departure from these preferred conditions, the more likely that alternative abutment types or drainage structure types (e.g., reinforced concrete box culverts or pipe culverts) should be considered. Under these circumstances, it is recommended that economic analyses be used to identify the preferred alternative. 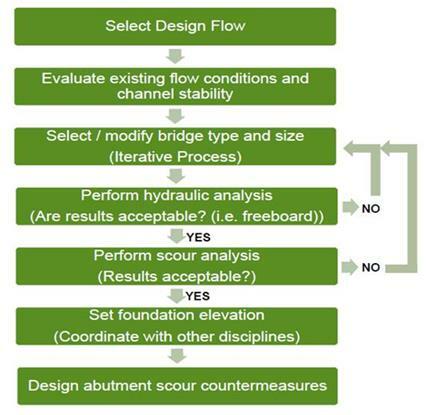 The bridge hydraulic design process applicable to shallow foundation abutments is illustrated in figure 123. Figure 123. Flowchart. Bridge hydraulic design process. Select/modify bridge type and size: As indicated in figure 123, this step is the beginning of an iterative process that evaluates the hydraulics and potential scour resulting from the alignment and grade of the approach roadways, as well as the size and orientation of the bridge. Proposed layouts of these elements must be hydraulically modeled for a range of discharges that includes the hydraulic design flood and the scour floods to accurately estimate the hydraulic parameters (e.g., depths and velocities) affecting the bridge, the approach roadways, and the floodplain. Set foundation elevation: There are two basic options for establishing the spread footing elevation: 1) the top of the footing may be set below the total scour depth for the scour check flood at the abutment, without the need for an abutment scour countermeasure, or 2) the top of the footing may be set at or below the contraction scour elevation for the scour design flood (includes any LTD), with a properly designed and constructed abutment scour countermeasure. As indicated in figure 123, the task of setting the final spread footing elevation can only be done effectively through in-depth consultation and coordination with the project geotechnical and structural engineers. 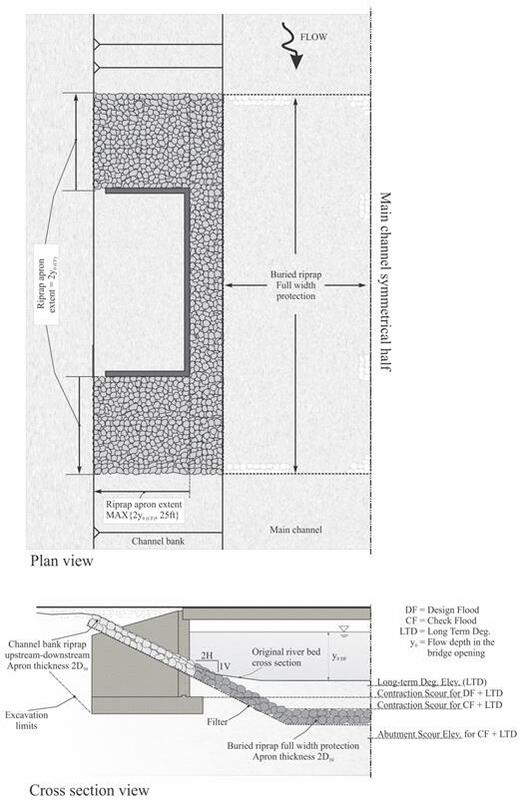 Design abutment scour countermeasures: When it is not practical to set the abutment foundation below the total scour depth, a designed abutment scour countermeasure is required to ensure stability during the scour check flood. See the sections entitled Scour Design and Scour Countermeasure Design later in this appendix for more information on the design of scour countermeasures for shallow abutment foundations. For shallow abutment foundation design, the following primary scour components must be computed and evaluated: (1) LTD, (2) contraction scour, and (3) abutment scour. Both the contraction scour and abutment scour components are sensitive to what sediment transport regime exists upstream of the bridge (i.e., live-bed versus clear-water) and whether the scour floods are under free-surface flow or pressure flow conditions (e.g., bridge girders are in the flow) at the bridge. Because of the dramatic increase in potential scour depth, pressure scour should be avoided, if at all possible. In addition, the abutment scour component is sensitive to the location of the abutment relative to the main channel. When the abutment is located close to the channel, the scour is computed differently than when it is some distance away (i.e. more than twice the main channel flow depth for the scour check flood). The manner in which these individual scour components are evaluated for floods up to and including the scour check flood standard is summarized as follows by flow condition. A specified depth for other degradation phenomenon, such as head cut depth, or historical observation. For clear-water conditions = Clear-water contraction scour estimate. ‒ Live-bed contraction scour estimate. ‒ Clear-water contraction scour estimate. LTD (same as for free-surface flow). Contraction scour (vertical) = Pressure scour. Abutment scour (component presently undefined for pressure flow; research in progress). The scour used to establish the spread footing foundation elevation is the worst-case combination of applicable scour components estimated for floods up to and including the appropriate scour flood standard (e.g., Q500 for scour check flood), and depends on the flow condition (i.e., whether free-surface or pressure flow exists at the bridge). The manner in which the individual scour components are combined for scour design is summarized below for each flow condition and illustrated in figure 124 through figure 127. The combinations listed are for abutments located close to the channel bank. Note that the underlining is a reminder to the user that measurements for scour check flood should be used and not those for scour design flood. Figure 124. Drawing. Free-surface flow with no scour countermeasure (option 1). Figure 125. Drawing. Free-surface flow with narrow-opening scour countermeasure (option 2). Figure 126. Drawing. Free-surface flow with full-width scour countermeasure (option 3). Figure 127. Drawing. Pressure flow scour countermeasure. Option 1 (no countermeasure): Minimum depth to top of footing = Total scour at abutment = LTD + abutment scour for the scour check flood (see figure 124). 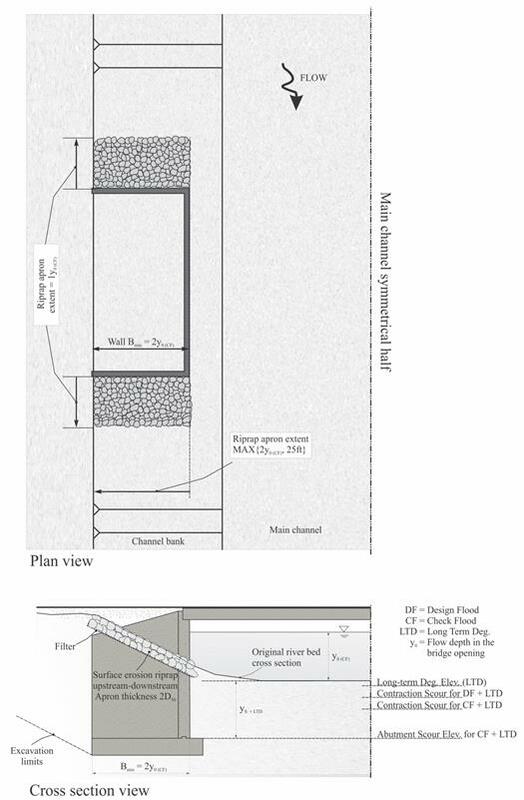 Option 2 (wide-opening countermeasure; for W2/y0 > 6.2 only): Minimum depth to top of footing = LTD + contraction scour depth for the scour design flood; minimum depth to top of abutment countermeasure apron = LTD + contraction scour for scour check flood (see figure 125). Option 3 (narrow-opening countermeasure): Minimum depth to top of footing = LTD + contraction scour depth for the scour design flood; full-width countermeasure protection required from abutment to abutment; top of full-width countermeasure below LTD + contraction scour depth for scour check flood (figure 126). Pressure flow countermeasure: Minimum depth to top of footing = greater of LTD or pressure scour depth for the scour design flood; full-width countermeasure protection required from abutment to abutment; top of full-width countermeasure below greater of LTD or pressure scour depth for scour check flood (figure 127). It is important to note that scour depths must be tied to an appropriate reference elevation. The channel thalweg elevation should be used as the reference elevation for abutments located near the main channel. When a shallow abutment foundation requires installation of a scour countermeasure, the countermeasure must include a horizontal apron designed to be stable for the scour check flood. The apron should surround the entire abutment face and extend upstream and downstream of the abutment. For free-surface flow options 2 and 3, the extensions should be a distance equal to twice the main channel flow depth through the bridge, 2y0. For pressure flow, the extensions should be a distance equal to twice the main channel flow depth upstream of the bridge, 2yu. In addition, the same designed countermeasure should run up the channel bank and protect the abutment embankment. To do this effectively, the countermeasure should be configured to cover the embankment to an appropriate height (including freeboard) and for a distance of 2 times the main channel flow depth or 25 ft (7.6 m), whichever is greater, behind the abutment and parallel to the roadway. Figure 124 through figure 127 illustrate the appropriate scour and countermeasure design configurations for the described flow conditions and options. Note that, although the countermeasure configurations are all similar, there are dimensional differences that make each case unique. Also note that the figures reflect the use of rock riprap as the countermeasure type. When riprap is used as the designed countermeasure, an appropriate filter must be placed under the riprap to prevent the underlying soils from being winnowed out through the interstitial openings between rocks. Wrap the geotextile layers on back side of abutment full height to enable the abutment to stand unsupported should the embankment fail. Extend the abutment embankment protection to the top of the embankment. There is also one hydraulic/structural design consideration for GRS type abutments. When a scour flood inundates an abutment, either by free-surface overtopping flow or pressure flow conditions, the top of the GRS mass is subject to unknown hydrodynamic forces that may scour GRS material from around the beam seat. Should either of these flow conditions be present, it is recommended that the GRS abutment be constructed wide enough to accommodate placement of the scour countermeasure on top of the GRS mass. Designing countermeasures for shallow foundation abutments in a river environment can also be a very complicated endeavor because of the complex interaction between the hydraulics, the multiple scouring mechanisms that are typically present, and the structural components. For these reasons, it is again of utmost importance that a qualified hydraulics engineer, experienced in river mechanics, sediment transport, and bridge hydraulics, perform the analyses required for countermeasure design. Inadequate rock quality, size, and/or gradation. Inadequate embedment and/or toe-down depths. No or improperly installed filter. A designed granular or geotextile filter must be installed under all riprap installations to prevent finer-grained base soils from being winnowed out through the passages between individual rocks, causing premature failure. After construction, riprap countermeasure condition and channel instability should be assessed during each regular bridge inspection and after large flood events. Any countermeasure failure or significant change in channel stability should be noted and scheduled for repair or stabilization. Without proper inspection and maintenance, a scour countermeasure may fail or a channel may become unstable, which can lead to bridge abutment failure.